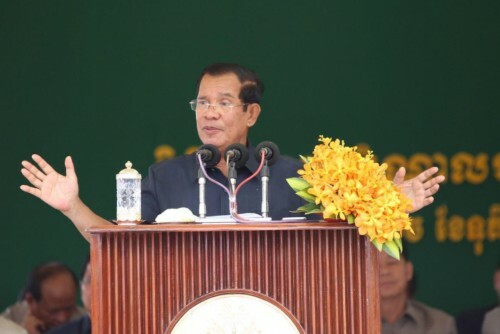 Prime Minister Hun Sen announced that the first session of National Assembly will be held on 5th September and the new government on 6th, addressing to 18,467 workers from 14 factories in Kampong Speu Province on Wednesday. Prime Minister Hun Sen said yesterday that he had requested His Majesty Norodom Sihamoni, King of the Kingdom of Cambodia, to change date of the convening of the National Assembly and the establishment of the new Royal Government. He explained that the changes of dates did not violate any laws, as the law stipulated that the establishment of the National Assembly shall take place within 60 days after the announcement of the election results. He added that on 15 August, the NEC will announce the official results, leaving some times to resolve any complaints. “The first session of parliament will be held on the morning of 5th September, and the oath will be taken same day in the evening […] the morning of 6th, the new government will be established and the oath will be taken same day in the evening. The first cabinet meeting will be on 7 September,” Prime Minister Hun Sen reiterated. Initially the premier announced that the first session of National Assembly will be held on 19 September and the new government on 20 September. Prime minister’s Cambodian People’s Party (CPP) won the sixth general election on 29 July 2018 receiving 4.8 million votes, or 76.78 percent, of the total valid votes, according to the National Election Committee (NEC)’s preliminary results.